"Structure for Salmon Fly Fishing"
Watching the ebb and flow of the baitfish school it dawned on me that their synchronized movements were a direct result of preying salmon. The baitfish would slowly disperse out from the kelp with the individuals spreading farther and farther from each other, then ... in a flash, they would be in a compact mass at the edge of the kelp, fins almost touching each other. It was obvious when the preying salmon had left for once again the baitfish would disperse, repeating the previous pattern as they flowed outward with the ebbing tide, then ... once again they would compact! I first became aware of the reasons for this behaviour when I happened to spot a single coho cruising on the fringe of the compact school. It was not hard to judge the terror that these yearling herring held for this powerful predator, even underwater in their environment they exuded that ultimate fear. Shoals are obvious in calmer waters where the dark nervous tidal waters pour over the shallows. 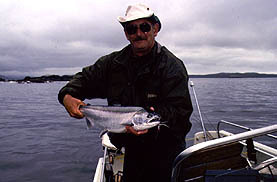 I was fly fishing for salmon and knew that where there were herring there would be preying salmon; baitfish=salmon, is the proven formula for angling success. The location I had chosen on this calm summer day was a kelp bed along the edge of a jutting point of land. The depth of the water was between 20 to 30 feet, an ideal depth for kelp, and, there was a constant flow of water as the tide ebbed and flowed. The flowing water provided the vital feed for the growing baitfish and the kelp provided their shelter. This was saltwater STRUCTURE fly fishing for Pacific salmon! KELP ..... this is the primary STRUCTURE for the saltwater fly fisher! It holds all the elements required by feeding salmon, constant currents and concentrated baitfish. Be quiet and observant when you boat to a kelp bed and look for the schools of concentrated baitfish. Anchor in that location or, as I have found to be very successful, tie up to a patch of floating kelp fronds with your bow rope. Be prepared to move on a regular basis when the baitfish school moves to another kelp location. Cast in such a manner that your fly will sink at the edge of the baitfish leaving it exposed when preying salmon spook the school back to the kelp. Go deeper, under the baitfish if you do not have strikes. Salmon will cruise under baitfish waiting to single out the unnatural. INTERTIDAL ROCKS ..... these can be found in sandy beach areas and provide STRUCTURE for baitfish safety. Some of my fondest memories of saltwater salmon fly fishing have occurred when I have anchored near large intertidal rocks. It has been there that I have watched salmon so voracious that they would beach themselves in their excitement to catch panicking baitfish, then, flop back into the water to keep from being stranded on shore. This is a continual moving situation for the fly fisher because of the sheer terror of the baitfish - they flow back and forth amongst these rocks, up and down the beach, seeking the safety of the intertidal boulders. Steep rock ledges tell of deep waters and often concentrated baitfish. TIDAL SHOALS ..... provide tidal current STRUCTURE that holds baitfish and concentrates feeding salmon. As the daily tides begin to flow faster and faster over these shoals they create a backeddy like when a river flows around a rock. Here is where the baitfish concentrate. 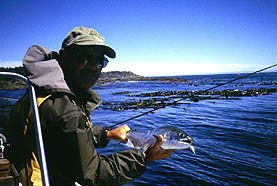 It is a prime feeding location for salmon and can be effectively covered by the fly fisher if they anchor. SUBMERGED ISLAND TOPS ..... create underwater forests of kelp, STRUCTURE that most baitfish seek. These locations can be found with a marine chart and a depth sounder. Anything deeper than 40 feet is too deep to fly fish effectively unless baitfish are at the surface. Kelp is the usual locator and gives the fly fisher the chance to tie up to the fronds if the tidal flow is correct such that the fly can be presented under the waving fronds. If not, then anchor nearby to capitalize on this key baitfish retreat location. 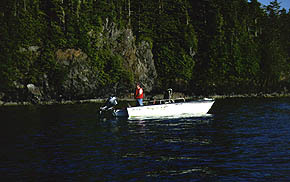 Concentrations of sports boats usually signal 'fish trails' where salmon move up to shallow 'baitfish meadows'. ROCK LEDGES ..... provide intertidal STRUCTURE that concentrates baitfish. Where there are steep cliffs above and below, I have often found that small schools of baitfish will concentrate on small ledges. In some locations I will actually tie my bow rope to the shore and cast parallel to the underwater ledges where salmon will come up for the baitfish. FLATS BETWEEN ISLETS ..... often grow eel grass beds, STRUCTURE where baitfish can hide when salmon come near. These need to be shallow zones between 20 and 40 feet, the ideal casting depths. 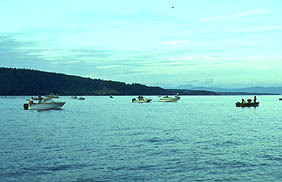 The tidal flow creates a current between the small islands that concentrates baitfish in these zones and draws feeding salmon. ISLETS and SMALLER ISLANDS ..... provide shallows and some underwater rocks that are the STRUCTURE where baitfish can hide. Search for kelp beds or shallows around the islands then anchor such that you can cast with the ebbing or flooding tide. These are the areas where baitfish are caught by feeding preying salmon. 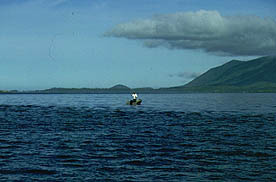 Submerged island tops and smaller islets concentrate salmon in shallows where they can be reached by the fly fisher. MASSES of FLOTSAM ..... provide feed and STRUCTURE for baitfish in open ocean situations far from shore. In the early summer, flotsam will concentrate near tide lines. Baitfish and other salmon feed use these as escape areas and feeding areas. Search for the leaping 'locator' salmon and concentrate your casting in that area. UNDERWATER CANYONS and LEDGES that travel upwards towards the surface..... provide STRUCTURE that can best be described as 'Fish Trails'. These are traveling locations coming up from the deep which the salmon follow to reach the 'baitfish meadows' in the shallows. Structure is where you find it. It changes with each tide and has a dramatic affect on the behaviour of baitfish and preying salmon. Try the obvious, then work the unknown. I have found salmon in many locations where I would never expect them, in all weather and during every tide. Salmon fly fishing is akin to a hunting experience where the angler deploys all his skills and knowledge searching for that location that holds accessible fish on the day he is on the water.